Eloquii Debuts Corporate Style with Its New Workwear Collection! Looking for plus size wear to work suiting and additional fashion options? 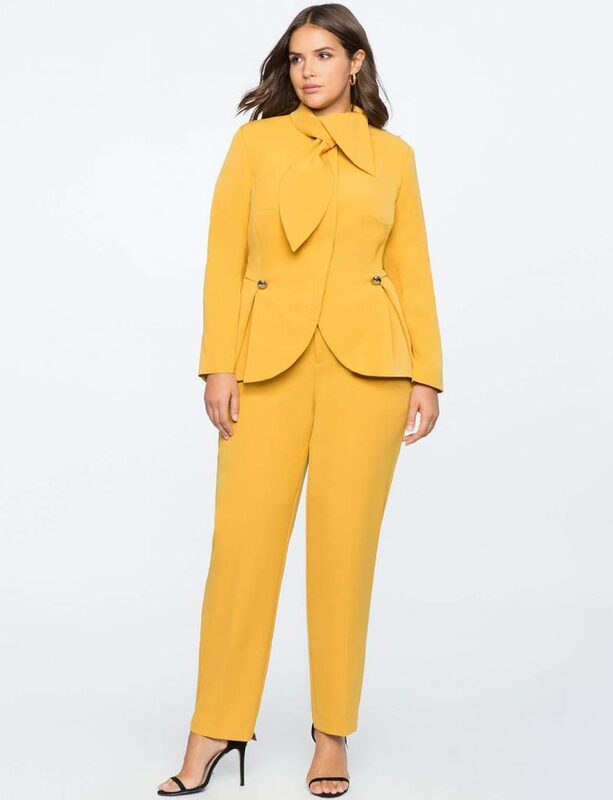 Plus size retailer, Eloquii has JUST released their Workwear collection to include fashion suiting AND they also debuted a workwear essentials kit, the 9 to 5 Kit! Searching for that perfect plus size suit just got easier! So, it looks like “ELOQUII, hurry up and take our money!” is going to be a mood for the entire first quarter of the year. Most recently, ELOQUII debuted their lingerie collection just in time for Valentine’s Day. Now, the plus size brand is here to make your corporate wardrobe a little bit fiercer. On the heels of our Curvy Boss addition, this new launch falls in step with what we are including more of, here at TCF…. Who remembers when the Eloquii 1.0 version (the first version of Eloquii) launched with their go-to plus size workwear collection? It was one of the only places we had for contemporary suiting options. When they relaunched with Eloquii 2.0, we just knew that they would come back with a few more strong plus size wear to work options for us! BUT, not so much… until now! Featuring over 22 styles, Eloquii has released their new workwear collection! With styles like the Peplum Blazer & Wide Leg Pant, the Ruffle Trim Double Breasted Blazer & Plaid Kady Pant and the Brocade Jacket paired with the Floral Brocade Kady Pan, Eloquii is on a mission to give us bold fashion that makes a statement- one that will easily take us from desk to dinner. Let us share with you a few of our favorite fashion work wear pieces, Eloquii just released! Oh! And ELOQUII ain’t done! Their new workwear launch is two-fold… with fashion wear to work options as well as its first ever retail kit called the “9 to 5 Kit.” For those of you looking to build your suiting game, your wear to work wardrobe, or wanting to give your current workwear items an overhaul, this 9-5 Kit gives you the flexibility to create up to 10 work-ready looks! These workwear essentials are designed to mix and match for endless office-ready looks. We worked overtime on tailored styles in our most luxe fabrics—at prices that make total business sense. What does this 9 to 5 Kit look like? Include? And the kit isn’t just all fun and games — the more items you put in your kit, the more you save: Take an extra 10% off on 2 Items and 15% off 3+ items! That makes total business sense, right? You can learn more about and shop the 9 to 5 Kit Here! Ohhhh and get this, the new Workwear collection, available now online and in store! Get your corporate curves in style with the new workwear collection at eloquii.com! I love the peplum blazer and asymmetrical yellow work dress! So, what pieces are you digging? Picture yourself in your office or cubicle putting everyone else to shame in these looks!! You better werk at work! New To TCF: For Our Plus Size Business Women & Owners, We Introduce the Curvy Boss Column! I’m hoping you could help me find sites for plus size prom dresses. I’ve searched SimplyBe, Torrid, Eloquii, and the like. From Desk to Dinner Date with these 14 Plus Size Suits for Spring!